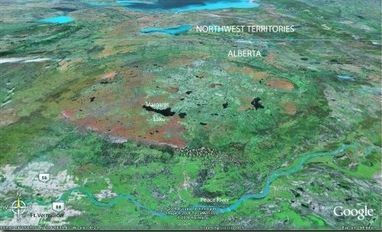 The Caribou Mountains in northern Alberta form a low, saucer-shaped plateau that rises 600-700 m above the surrounding lowlands. Adjacent to the western side of Wood Buffalo National Park the Caribou Mountains have the highest elevations in northern Alberta, reaching a maximum of 1,030 m in the western part of the plateau. The Caribou Mountains in northern Alberta form a low, saucer-shaped plateau that rises 600-700 m above the surrounding lowlands. Adjacent to the western side of Wood Buffalo National Park the Caribou Mountains have the highest elevations in northern Alberta, reaching a maximum of 1,030 m in the western part of the plateau. The area contains sensitive wetlands, unique permafrost features, rich breeding bird habitat, and core refugia for woodland caribou. In 2001 as part of the Special Places program, Caribou Mountains Wildland Park (5,910 km2) was created. 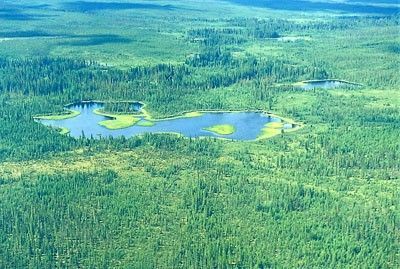 The largest provincial Wildland Park in the province, its fragile ecosystem contains sensitive wetlands and permafrost habitat. The Park contains relatively undisturbed and lichen-rich forests, favoured habitat for woodland caribou. About 80 percent of the range of an important population of woodland caribou is contained within the Park, and about a third of Alberta’s population of this threatened species is dependent on the Park. A population of up to 120 wood bison, an endangered species, lives in the Wentzel Lake area in small groups of up to 15 animals. Caribou Mountains Wildland Park was established in 2001 by Order-in-Council 308/2001. At 5,910 km2 it is the largest provincial wildland park. A Management Plan has yet to be approved. A local committee has been charged with developing a management plan, but dissension over the status of the park has occurred within the committee. Due to its isolation, a paucity of good biological information, and a lack of solidarity toward preservation, the Caribou Mountains have been and continue to be vulnerable to exploitation. The Alberta Woodland Caribou Recovery Plan states that the park’s herd, which ranges over almost all of the Wildland Park, is declining, with a population drop of greater than 40 percent since 1995. Motorized access will further stress woodland caribou, an endangered species, as well as other wildlife. Permafrost occurs on the plateau and is extremely vulnerable to melting and erosion from surface disturbance. Currently, snowmobiles and all-terrain vehicles are being used illegally in Caribou Mountains Wildland Park with no monitoring and no enforcement of the Provincial Parks Act 27(1), which does not permit snowmobile and ATV use in the park. The amount of usage is unknown. Although there is little oil and gas development, the area contains substantial geophysical exploration lines. Timber harvesting occurs along the southern edge of the caribou range. Roughly 40 percent of the area, including over one-third of the land mass of the plateau, has been burned as a result of two major fires in the 1970’s; 12 fires (covering a substantial area) in the 1980’s; and 3 main fires from 1991-1996. It will take 20 to 30 years for the burned areas to recover as functioning caribou habitat. The Caribou Mountains form a low, saucer-shaped plateau that rises 600-700 m above the surrounding lowlands. Left unglaciated in the last ice age, the mountains contain remnant communities of lichens, vascular plants and mosses not found in the adjacent country. The highest elevations in northern Alberta are within the Caribou Mountains and reach a maximum of 1,030 m in the western part of the plateau. Bedrock of the area consists of shale and sandstone, with gravel capping the hills. Topography is undulating to rolling. Slopes at the edge of the plateau are moderate to rugged, with the steepest slopes occurring in the northwest and rising 310 m in 2 km. Most of these slopes are very unstable and significant slumping has occurred. The climate of the area is boreal cold-temperate continental, with cold winters and short, cool summers. Fort Vermilion, 50 km south and 500 m lower, has a mean daily temperature of -1.4 C and a total annual precipitation of 360.1 mm. The area contains sensitive wetlands, unique permafrost features, rich breeding bird habitat, and core refugia for woodland caribou. Permafrost, which is discontinuous in the Caribou Mountains area, is estimated to be from 1 to 3 m below the surface. The area contains extremely rare landforms such as the string flark fens and palsas. Palsas are roughly circular mounds of perennially frozen peat and mineral material. String flark fens develop on slopes and are characterized by narrow peaty ridges (“strings”) that enclose open water pools (“flarks”). Northern Mixedwood and Central Mixedwood Subregions: the lowlands of the Peace and Hay Rivers. Aspen and balsam poplar occur, except in areas where the lack of fire has enabled white spruce and balsam fir to reach maturity. Lower Boreal Highlands Subregion: along the slopes and deeply cut river valleys that come off the plateau. Aspen/balsam poplar/white spruce mixes grow here, with some jack pine or lodgepole pine hybrids on the better drained sites. Boreal Subarctic Subregion: Occurs on the plateau, which covers most of this Area of Concern and almost all of Caribou Mountains Wildland Park. Open stands of widely spaced black spruce over a moss and lichen groundcover are the most abundant vegetation. The area is believed to contain some of the highest concentrations of lichen growth in Alberta. Organic soils/peatlands are widespread. The very cold soils are underlain by permafrost. Some well-drained ridges have white spruce, aspen and jack pine. Only 4 percent of Alberta is Boreal Subarctic Subregion. Drainage on the Caribou Mountains plateau is restricted, which has resulted in the formation of numerous deep, cold lakes, the largest being Margaret, Wentzel, Eva, and Pitchimi. Fast-flowing and usually steep-banked rivers flow off the plateau into the Hay River, Great Slave Lake, and Peace River basins, which all drain into the Mackenzie River. The river banks are unstable and slumping occurs along most river stretches. The plateau is characterized by a few dry ridges carrying aspen, white spruce, and scattered lodgepole pine and by huge peatlands that cover most of the area. Slumping of peatland occurs along the Ponton River and nearby lake shorelines, exposing profiles of peat that are up to 10 m thick. The black spruce peatlands are dominated by upland bryophytes and lichens. Black spruce/lichen woodlands also cover large areas of the plateau. Fire is an important component of the forests of the Caribou Mountains and the great majority of the plateau consists of stands that are early-late post fire successional with much deadfall and standing snags. The area has been severely impacted by fire over the last twenty years. If the insulating organic cover (vegetation, mosses and lichens) is disturbed, the permafrost beneath can melt and erosion and damage to vegetation, soils, and water flow regime can occur. As of 1997, 73 lichen species, 61 bryophytes, and 230 vascular plants, including many rare and unusual species, had been identified based on data from randomly chosen study sites. A stand of pure lodgepole pine growing along the shore of Fleming Lake is believed to be the most northeasterly occurrence of this species. Northern ground-cone (Boschniakia rossica) was identified along the west slopes of the mountains, the only known location of this plant in Alberta. The Caribou Mountains Wildland Park provides habitat for woodland caribou, a species designated as endangered in Alberta under the Wildlife Act. The Alberta Woodland Caribou Recovery Plan states that the park’s herd is declining, with a population drop of greater than 40 percent since 1995. The caribou range over almost all of the Wildland Park. The range is believed to be one of the largest known caribou winter ranges in the province. The caribou are believed to use the treed slopes of the mountains when the snow is deep on the plateau. Eighty-four species of birds have been recorded in the area, including exotic wood warblers. The region contains one of the two known nesting sites of the red-throated loon. Waterfowl, shorebirds and birds of prey such as osprey and bald eagles use the lakes and rivers for nesting and staging. American white pelicans are believed to stop in the area on their way to their nesting grounds further north. The Caribou Mountains are also one of the two known nesting areas in Alberta for the elusive American tree sparrow. Twenty-two species of mammals (not including furbearers) have been recorded on the plateau. Furbearers such as mink, muskrat, beaver, wolverine and river otter also use the area. A local native indicated that he sighted a grizzly bear on the west slopes on the mountains in the lat 1940s. The Caribou Mountains provide habitat for species found much further north, including gray-cheeked thrush, red-necked phalarope, red-throated loon, American tree sparrow, mew gull, pacific loon and surf scoter. A population of up to 120 wood bison lives in the Wentzel Lake area in small groups of up to 15 animals. As of 2001, all animals from this herd that were tested for diseases tested negative but it is not known whether the entire herd is disease-free. Except for the Bison Management Area in the northwest corner of Alberta, which contains disease-free wood bison that are considered wildlife and are designated Endangered under the Wildlife Act, wood bison are not considered wildlife in Alberta and therefore can be hunted year-round. Hunting of wood bison is prohibited within Caribou Mountains Wildland Park. Lake trout and lake whitefish occur in the lakes in the Caribou Mountains and the headwaters of rivers flowing from the mountains contain Arctic grayling. All lakes and streams are cold and the fish grow slowly. Arctic grayling are very sensitive to siltation of their habitat. Trapping, hunting, and guiding-outfitting occurs in the Park. There are two fly-in fishing lodges in the Park, one on Margaret Lake and the other on Pitchimi Lake. Fishing pressure on the slow-growing fish is currently controlled by a restriction on the number of commercial fishing lodges in the area. The south central and south eastern escarpment of the Caribou Mountains in northern Alberta is part of the traditional lands of the Little Red River Cree Nation and Tallcree First Nation, who have inhabited this area for over 5,000 years. A lodge agreement exists between the Little Red River Cree Nation and the province. Several historic and prehistoric aboriginal settlements are known to exist in the area. At one time there were 8,000 Beaver Indians in the area. They suffered massive death due to disease and numerous Beaver Indian graves can be located at Margaret Lake. The draft management plan remains unproduced. Aboriginals discover two kill sites in Caribou Mountain Wildland Provincial Park. It appears the animals were killed as trophies, as the heads and hides had been removed, but the meat was left to rot. Tourism, Parks and Recreation informs AWA that the Caribou Mountains Draft Management Plan is now undergoing review by Government of Alberta staff. Once their comments have been incorporated, the draft plan will be posted for public review. Following the public review period, an Advisory Committee meeting will be called, possibly in fall 2008, to review the final draft. Community Development informs AWA via telephone that the Management Plan is still being revised following the February Public Advisory Committee meeting. The Committee members may receive the revised plan by the end of the summer and public consultation may begin in the fall of 2007. Alberta Community Development invites AWA to join the Caribou Mountains Wildland Park Management Plan Advisory Committee. AWA agrees and requests funding to attend the meetings in Fort Vermilion but is denied. AWA requests accommodations to join the meetings by teleconferencing. AWA does not object to the continuance of commercial trapping in the park where pre-existing commitments are honoured, but emphasizes that a management plan must clearly outline phasing out of these activities without detrimental effect on those who have been making their living in the park. AWA appreciates that a deferral is appropriate, but emphasizes the importance of obtaining provincial ENGO input in this process. AWA supports the minister’s decision not to consider the PAC co-managing the park. AWA supports the minister’s decision not to consider changing the park’s wildland park designation. AWA advocates a phasing-out of traditional operations and ensure that any expansion to existing operators’ plans is curtailed. AWA is opposed to the practice of baiting and states that this practice should not be allowed and should be banned. AWA requests no further extension of concessions to recreational OHV users, and emphasizes that it believes there should be no OHV access within the park. AWA expresses concern that if even a single OHV trail is authorized, illegal use off trail would almost be guaranteed, based on the experience elsewhere including in Bighorn Wildland. The area is very remote and enforcement would be next to impossible. AWA may not be opposed to aircraft access as proposed by the minister, but is concerned with what mechanisms are in place to control and enforce activities, and how to limit growth and size of operations and flights. AWA stresses that ecosystem-based planning fundamentals need to be in place in the management plan and provincial-scale perspectives be retained in the process, including the need for ENGO representation. The minister reiterates that the input from the local committee is one of just many forms for input that will be solicited for the management plan, and although provincial ENGO’s are not represented on the committee, the will have ample opportunity to provide input into the management plan. AWA obtains a copy of a letter dated April 28, 2006 from Alberta Community Development Minister, Denis Ducharme, addressed to Messrs. William Neufeld (Reeve, M.D. of Mackenzie No.23) and Jerry Chomiak (Caribou Mountains Wildland Management Plan Advisory Committee) responding to Mr. Chomiak’s letter of March 29, 2006. The letter addresses the key points as follows. The government is committed to honouring existing commercial trapping in parks and protected areas established under the Special Places program. Trappers should still work with his department to ensure they have the necessary approvals and permits. The minister is willing to consider waiving the annual fee for dispositions. Management of bison in northern Alberta is being developed in an inter-governmental forum. Bison hunting within the wildland will be deferred until these discussions have concluded. There are good opportunities for bison hunting in more accessible areas outside the wildland. ACD has full responsibility for the administration and management of legislated provincial protected areas on behalf of all Albertans and is not able to consider the Advisory Committee co-managing the wildland. The wildland park status was designated under a Cabinet decision based on recommendations by the Special Places Provincial Coordinating Committee and the park status has wide public support. The wildland classification was created in part to manage large, undeveloped protected areas and to accommodate activities such as hunting and trapping in these areas, and the wildland designation is appropriate for this area. Also, separate legislation for the area is contrary to the government’s objectives to limit the duplication and complexity of Alberta’s protected areas legislation. The minister is willing to consider, on an exception basis, enabling the few existing commercial guide-outfitters working in the wildland to continue traditional operations associated with hunting big game animals subject to obtaining the necessary permits and authorizations. This accommodation, however, does not extend to any subsequent commercial guide-outfitters. Baiting of wildlife is generally illegal in Alberta’s parks and protected areas, but the minister is willing to consider, on an exception basis, permitting those few existing commercial guide-outfitters who have bear allocations for this area to bait bears and wolves within the wildland until such time the issue of baiting is resolved province-wide. The minister will consider, on an exception basis, the approval of a designated access route for off-highway vehicles (OHVs) and snowmobiles to one or more lakes in the winter, under frozen ground conditions, for the purpose of ice fishing. While the minister is willing to enable trappers and those few existing commercial guide-outfitters to use their OHVs at other times of the year to facilitate their traditional trapping and hunting operations, he is not willing to extend this concession to recreational OHV users on a general basis. 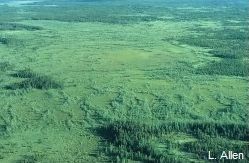 The permafrost environment of the Caribou Mountains plateau is very sensitive to this type of disturbance and cannot be reclaimed or re-established once it is lost. The minister will consider the opportunity for pilots to obtain permits to land fixed-wing aircraft on designated lakes for approved trapping, recreational and commercial hunting, fishing, or other authorized recreational, commercial or research-related activities. The authorizations would only be issued to the aircraft operator, not the individual being serviced by the aircraft. The intent for committee membership was to involve local people who were familiar with the Caribou Mountains. He agreed with AWA that provincial conservation organizations are not represented, but both local environmental interests and First Nations interests are well-represented on the committee. The Minister states the majority of meetings are open to the public, but a small, focused workshop occurred on March 11, 2006. Prior to the workshop, committee members were canvassed as to whether AWA and a local off-highway group should be invited to the workshop or sit on the committee. The Minister was advised that a decision was made to proceed with only advisory committee members, as per the original terms of reference, but the intent is to revisit representation as outlined in the terms of reference at the next open advisory committee meeting. The Caribou Mountains Wildland Management Plan Advisory Committee is only one step in the process towards completion of a management plan, and as the Wildland Park is of interest to all Albertans, the draft plan will be given broad circulation to provincial organizations and to the general public for comment. Existing commercial trapping in Caribou Mountains Wildland will be honoured. Community Development will consider waiving the annual fee associated with leases issued for trappers’ cabins. Further decisions on bison hunting within the Wildland will be deferred until high level inter-governmental discussions have been concluded. Community Development has full responsibility for managing all legislated provincial protected areas on behalf of all Albertans and is therefore unable to consider the Advisory Committee co-managing the Wildland. Reclassification of the Wildland is not an option since the classification was a Cabinet decision based on recommendations by the Special Places Provincial Coordinating Committee with wide public support. Community Development is willing to consider, on an exception basis, enabling existing commercial guide-outfitters to continue their hunting of big game animals. However, this exception to current legislation and policy will not extend to a new operator, should the allocations be reassigned. Although baiting of wildlife is illegal in Alberta’s parks and protected areas, Community Development will consider permitting existing commercial guide-outfitters who have bear allocations in the area to bait for bears and wolves in the Wildland. However, this exception will not extend to a new operator, should the allocations be reassigned. In the final Management Plan, Community Development will consider, on an exception basis, the approval of a designated access route for OHVs and snowmobiles to one or more lakes in the winter for the purpose of ice-fishing. Trappers and current commercial outfitters will be permitted to use their OHVs at other times of the year as well. This concession will not be extended to recreational OHV users. Community Development will consider granting permits to land fixed-wing aircraft on designated lakes in the Wildland to support approved recreational, commercial, or research activities. The permits will be issued to aircraft operators, not to those being serviced by the operators. Public Advisory Committee member Jerry Chomiak is quoted by CBC as saying that the committee would like a management plan that allows for more activities in the park, especially ATV access in both summer and winter. Chomiak reports that the PAC wants the level of protection of the area downgraded. AWA spokeperson David Samson says increased ATV use would hurt the declining woodland caribou herd in the area. The Park was given its current status under the Special Places legislation and changing or revoking it would be going against what the public asked for. April 7: In a letter to Community Development Minister Denis Ducharme, AWA’s David Samson requests that the Minister (1) rebuke the Caribou Mountains Wildland Park Management Plan Advisory Committee and its request to revoke the Wildland Park status and (2) allow representation on the committee from provincial ENGOs. March 31: In an email from Advisory Committee member Eric Grinnell to Committee Chair Ken Zurfluh, it is noted that Committee member Jim Webb does not agree with the decision made at the Committee’s March meeting to ask the Minister to reconsider designation of the Wildland. March 29: In a letter to Community Development Minister Gary Mar , Jerry Chomiak of the Caribou Mountains Wildland Management Plan Advisory Committee says that the Committee was unaware that the Caribou Mountain Wildlands had been designated a Wildlands Park (on July 24, 2001), a designation that Chomiak calls a “unilateral decision” (see October 2002). He goes on: “The current designation as a Park under the Provincial Parks Act does not have the support of the Committee, and was never recommended, discussed, or agreed upon by this Committee or to the best of our knowledge by its predecessor, the Special Places Committee which was made up of the same members.… The Committee requests that the Minister revoke the Wildland Park designation, and that specific legislation to manage the area be passed.” The letter is signed by Chomiak on behalf of all Committee members, despite a lack of consensus within the Committee on revoking Park status. There is a need for protection of the area over and beyond the levels for the Green Zone in Alberta. The committee questions the designation of this area as a Wildland Park and proposes that a management plan be developed to form a base for unique legislation to govern and enforce this area, as was done for Willmore Wilderness Park. The Committee requests co-management status (rather than advisory status) so that their decisions are more respected and enforceable. Bison management and hunting should be treated the same as in the adjacent Green Zone. Commercial activities should be examined on an individual basis. members of the committee intend to lobby intensely, on behalf of local interests, to demand major changes to the wildland park including increased OHV access, potentially more recreational and industrial development in the park, and even the possibility of revoking the Wildland Park status. March 21: AWA writes to the Hon. Gary Mar, Minister, Alberta Community Development, expressing concerns over the lack of provincial representation, questioning the committee’s mandate, identifying the importance of involving the First Nations Community, calling for public hearings on any new developments, and identifying the need for stronger protection in this and other protected areas. March 11: At an Advisory Committee workshop, the Committee agrees to challenge the definition of Wildland Park of the Caribou Mountain region. They identify the main issue and concern regarding Wildland Park designation as access. The management plan must be developed within the parameters of existing legislation and policy. The designation of the park prohibits new industrial activity such as forest harvesting or oil and gas exploration and development. There is value in having protected areas where access is either limited or difficult. Because it is illegal to hunt bison in the Park, the provincial government cannot issue a permit for bison hunting. Under the Parks Act you cannot feed wildlife. You can still hunt for bears in the Park but baiting bears must be done on lands outside the Park. Guide/outfitter allocations are annual commitments and do not grant any long-term exclusive rights to a particular land base or resource. Sustainable Resource Development does not view guiding/outfitting as a long-term commitment and retains complete discretion with respect to allocations. Trappers’ cabins are to be used for trapping business only, not for other commercial purposes. October: In a letter to Energy Minister Murray Smith (October 3), conservation specialist Lara Smandych reiterates AWA’s opposition to the pending sale of license #B0806 (20030416), requesting that this licence not be sold as it falls within AWA’s Caribou Mountains area of concern. July: A team of scientists studies invertebrates, birds, plants, lichens, fisheries, mosses, soils, etc. in the Wentzel Lake area. Expansion of the current boundaries of the Park to include all woodland caribou and bison range. Cessation of logging in the Caribou Management Zones adjacent to the Wildland Park. No increased commercial use of the area unless it clearly does not contribute to degradation of the environment. Ecologically sustainable rates of use on existing trails where motorized use is permitted. Careful monitoring of fishery resources to ensure their maintenance or restoration, if necessary. Sufficient resources to monitor and control negative environmental impacts. Ongoing monitoring of wildlife populations to ensure sustainability. No hunting of woodland caribou or bison until comprehensive research has been done. Engagement of local indigenous peoples by the government in discussions regarding some form of co-management of the Park. March 14: In a letter to Energy Minister Murray Smith, conservation specialist Tamaini Snaith expresses opposition on behalf of AWA to the pending sale of license #B0806 (20030416), requesting that this licence not be sold as it falls within AWA’s Caribou Mountains area of concern. Due to concerns that the Local Committee’s recommended site was too large, 5 townships in the northwest corner of the site were not included in the final designation as a Wildland Park because of the industrial and metallic minerals exploration interest in the area (Ashton Mineral Leases). 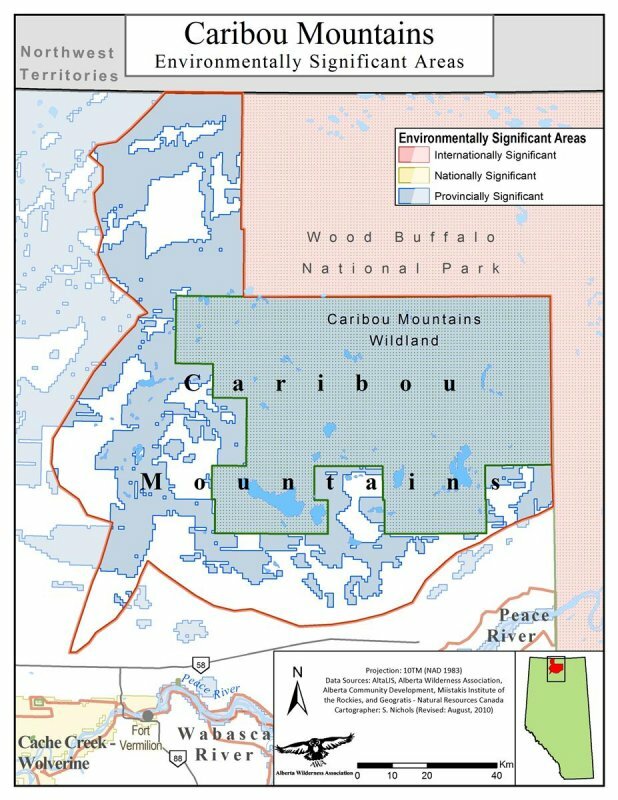 Ashton completed some exploration testing in the Caribou Mountains, and subsequently their permits were not renewed in the Wildland nor in the five townships on the northern boundary. “The Caribou Mountains Local Committee recommended the area be protected … but didn’t make a recommendation on what class of protected area it should be designated as. After the report was received, Government looked at all the recommendations and chose a designation that was a best fit – in this case a Wildland Park” (Doug Bowes, Alberta Community Development, Parks and Protected Areas). It is agreed that most decisions will be reached through consensus. Dissenting views will be recorded and passed on to the Minister. If consensus cannot be reached on an issue, it will be recorded as such. There are no petroleum and natural gas dispositions with surface access or metallic and industrial mineral permits in the Wildland. Avelyn Nicol, Planning Advisor for Parks and Protected Areas, states that any future sales of PNG would not have surface access – companies would have to drill from outside the Park. 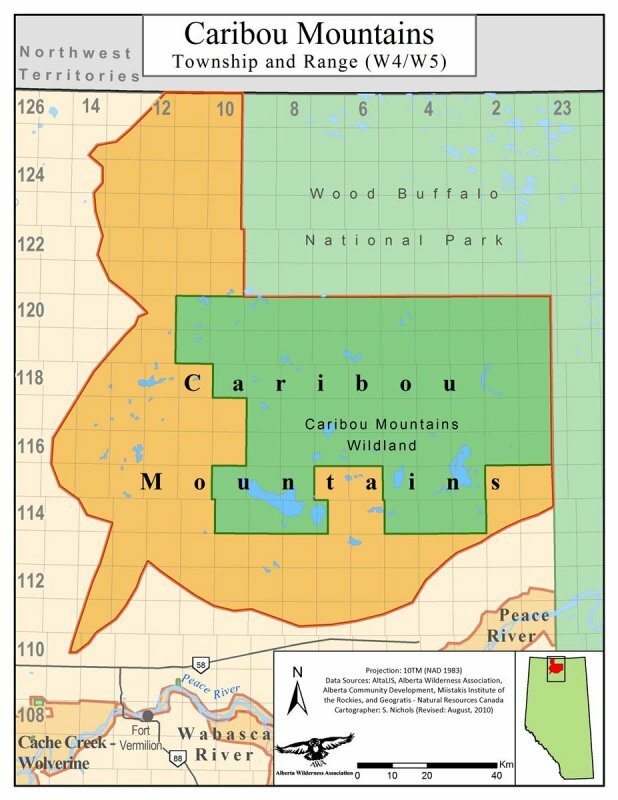 July 24 – Caribou Mountains Wildland Park is established by Order-in-Council 308/2001. July: The Alberta Woodland Caribou Conservation Strategy Development Committee delivers a report to the provincial Director of Wildlife Management. This is the third strategy for woodland caribou conservation that has been written and shelved. The report recommends a decision-making process, identifies information needs and management tools, and proposes specific implementation milestones. The goal is to develop a strategy that will result in “healthy caribou populations in perpetuity throughout Alberta’s caribou range.” Although the proposed strategy is not approved by Alberta Environment, staff and a number of stakeholders have used the strategy for guidance in the planning and implementation of resource management activities on woodland caribou range. The lack of endorsement of senior government officials is viewed by some as a lack of commitment to caribou conservation efforts. February: Environment Network News (Jan/Feb) reports that Home Oil has voluntarily agreed to curtail development in the Caribou Mountains for one year. This emerged from an analysis conducted by Gray Jones of the Western Canada Wilderness Committee in which Jones worked with lichenologist and botanist Dr. Bernard DeVries. April 24: Caribou Mountains Resource Management Plan (Draft) is released by Alberta Environmental Protection. The Plan is to be updated every five years with a full public review. While any change to the intent of the plan requires public review, minor changes can be requested and are handled by the Peace River Regional Resource Management Committee. February: In letters to the ERCB, AWA and the Western Canada Wilderness Committee request that the ERCB rescind the approved well licenses for Home Oil in the Caribou Mountains until a full public hearing is conducted and a comprehensive environmental assessment has been done. “The Strategy for Conservation of Woodland Caribou in Alberta” is drafted by the provincial wildlife management agency. Few recommendations from this report are adopted, and the plan receives considerable criticism from government agencies, public groups, and industry. 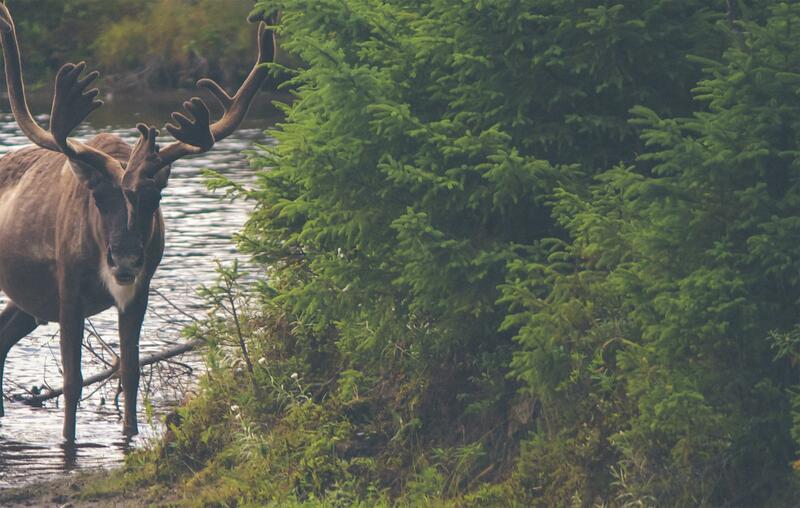 November: A multi-stakeholder committee known as the Woodland Caribou Conservation Strategy Development Committee (WCCSDC) is formed to scope issues and develop yet another provincial woodland caribou conservation strategy. Environmental Protection staff meet to discuss the future management of the Caribou Mountains. 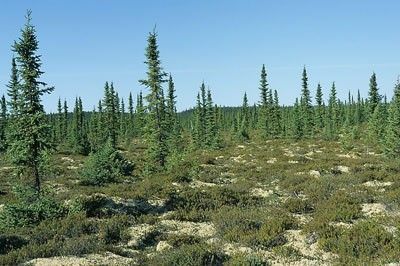 A drilling operation by Home Oil in the Caribou Mountains raises concern about damage to permafrost and protection of woodland caribou populations. The “Woodland Caribou Provincial Restoration Plan” (Edmonds) is proposed. The second of two ecological surveys of the area (the first in 1976) is completed (Natural Areas of Energy and Natural Resources with the Alberta Ecological Survey). Recognition of the need for a provincial management plan for caribou conservation begins. 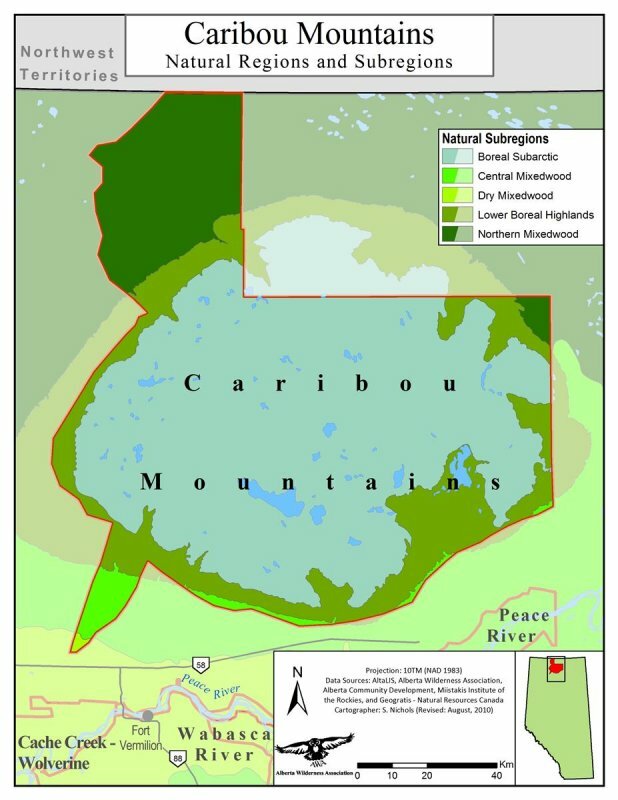 The Caribou Mountains Draft Management Plan is divided into the following categories, each of which contains objectives and guidelines relevant to that category: access and structures, ecological resources, fish and wildlife resources, forest resources, historical resources, mineral resources, permafrost, recreation and tourism resources, water and watershed.